Here’s another dish that’s loaded with fantastic flavors. This is my take on Indian lamb korma. I’ve reduced the loads cooking oil with a couple of tablespoons of ghee, which add a wonderful depth of flavor. I’ve replaced almonds (which unfortunately I can’t eat 😦 ) with cashew nuts. I usually try to stay away from cream in my recipes, but the light cream in this dish is important. I’m also a fan of garam masala, so I add lots of that too! It all comes together wonderfully in the oven. 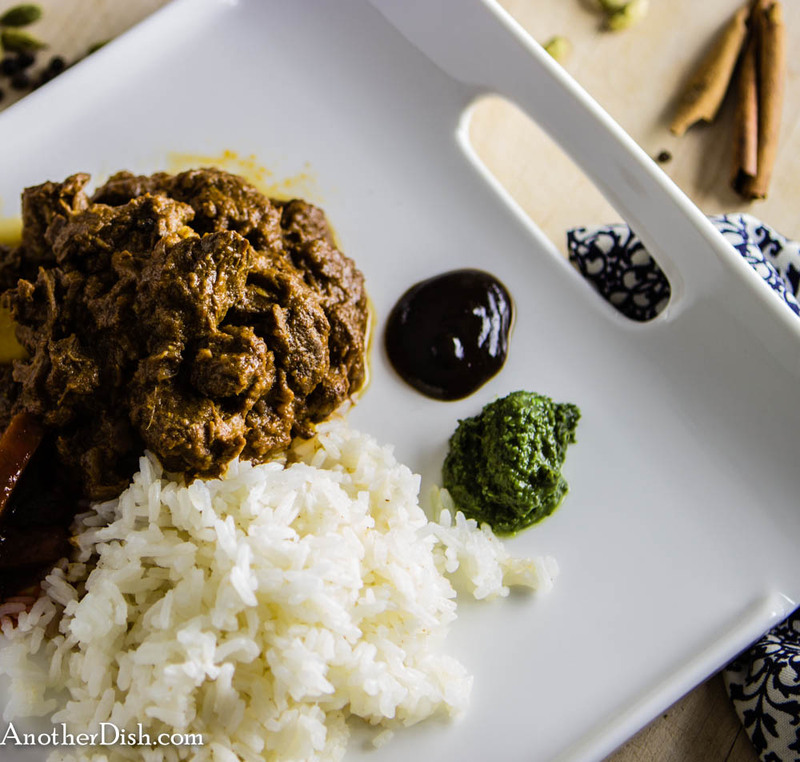 I like to serve it with an assortment of Indian relishes and chutneys. Hope you’ll give it a try and let me know what you think! Place garlic, ginger, cashews and 6 Tbsp water into a food processor. Process to a very fine paste. In a large Dutch oven, heat 1 Tbsp of the ghee over high heat. Add lamb and brown, about 5 minutes. Remove with a slotted spoon and set aside. Add another 1 Tbsp ghee. Cook liquid down, about 1 minute. Add cardamom pods, cloves and cinnamon stick and stir 30 seconds. Add onions and cook 5 minutes. Reduce heat to medium. Add garlic paste, coriander, cumin and cayenne. Stir-fry for about 3 minutes. Add back meat and its juices. Stir in cream and the rest of the water (8 oz). Increase heat to high. Stir and bring to a boil. Deglaze pan. Cover, place in oven and bake 1 hour. Remove from oven and stir in garam masala. Season with additional salt, if desired. 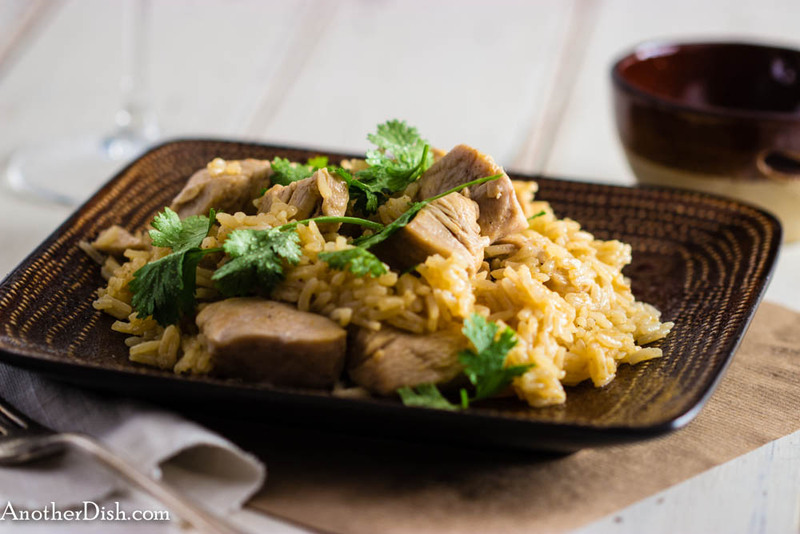 Serve with cumin-scented rice with peas. This entry was posted in Indian, Lamb, Main Dishes and tagged Cooking, Curry, Food, Food Photography, Foodie, Garam Masala, Indian Food, Recipes, Spicy on March 9, 2015 by AnotherDish. 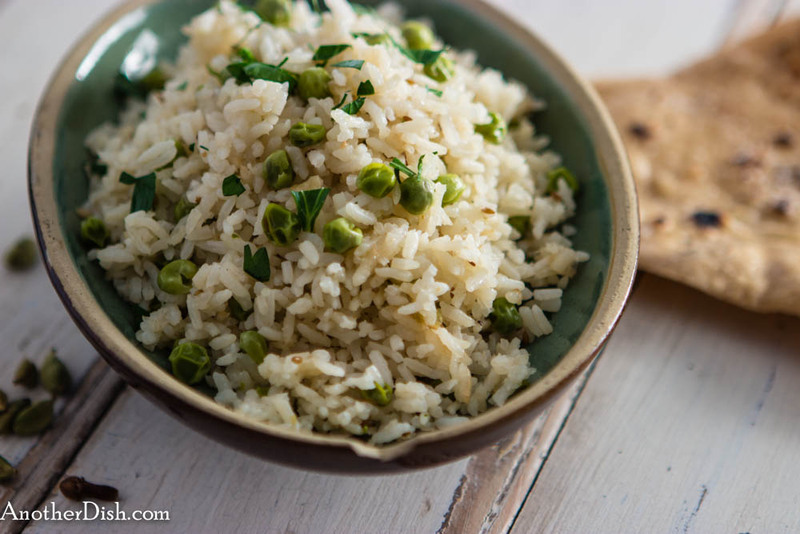 This flavorful rice dish can be eaten on its own with some naan or chapati as a light meal, or it can be served as part of an Indian meal. What make this great for me (aside of course, from the cumin! }, is the ghee (clarified butter). I’ve made clarified butter by cooking out the milk solids, and have used that in Indian cooking, but it is never the same as store-bought ghee. Ghee is what makes this rice dish Indian (to me, at least). For a few years now, I’ve made sure that I have it on-hand in the pantry — it seems to keep for quite a while!. Anyway, please give this dish a try, and let me know what you think. 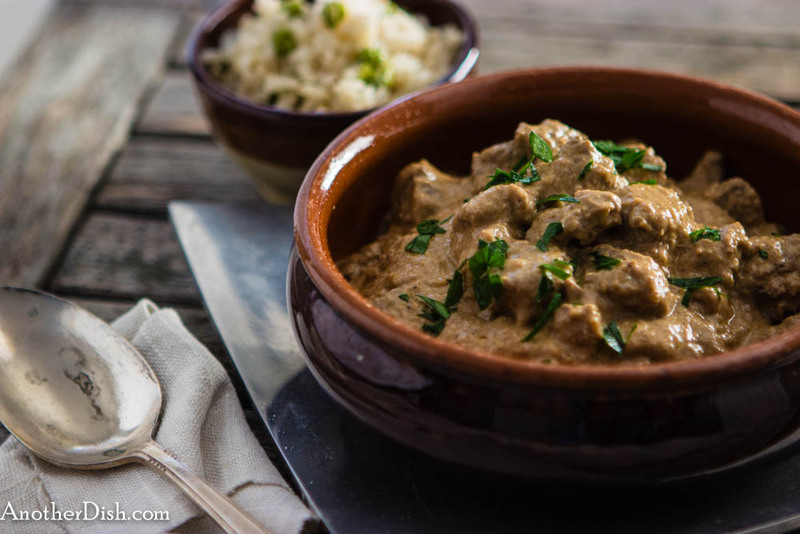 I made it this past weekend with lamb korma, another delicious recipe for which I’ll be blogging about soon! Rinse rice well in cold water, changing the water until it is no longer cloudy. Place rice and 4 cups cold water in a medium bowl and let stand 30 minutes; drain. Meanwhile, heat ghee in a medium sauce pan over medium heat. Add cumin seeds and stir for a few seconds. Add onions and sauté 8 minutes, or until onions begin to brown. Stir in peas, rice and salt. Stir-fry for about 4 minutes. Stir in 2 cups cold water, turn heat to high and bring to a boil. Reduce heat to very low, cover and simmer for 25 minutes. Remove from heat and fluff rice with a fork. Cover, and let stand for at least 5 minutes. Serve as a component of an Indian meal. This entry was posted in Indian, Vegetarian and tagged Comfort Food, Cooking, Food, Food Photography, Foodie, Indian Food, Recipes on February 25, 2015 by AnotherDish. Last night was snowy and cold once again here in New England — a perfect evening for Rogan Josh! This Indian stew is commonly made with lamb, but I decided to make it with beef, since the roads were bad and this is what I had on-hand in the freezer. Beef works well. The aroma from the wonderful spices in this dish made the whole house smell great as it was braising in the oven. 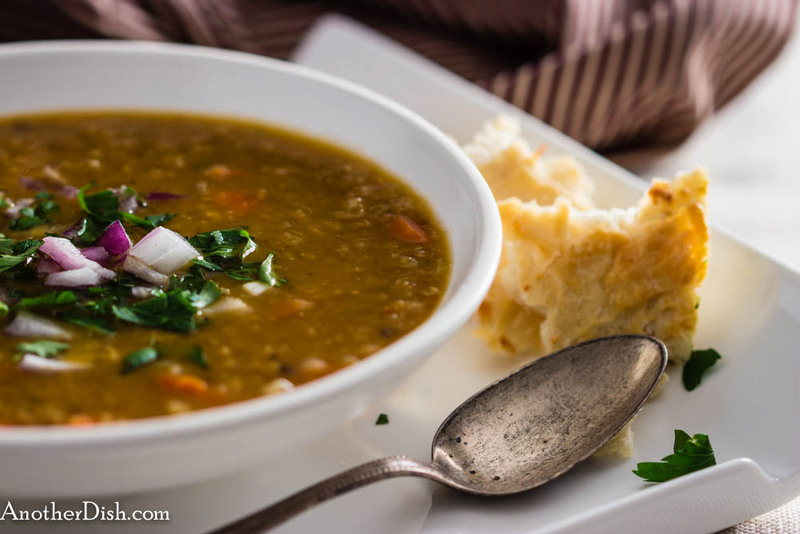 Whether it’s cold or not where you are, I think you’ll like this dish, so please try it tonight! Add ginger, garlic and 4 Tbsp water to a blender. Blend into a paste. Heat 1 Tbsp oil in a Dutch oven over medium-high heat. Add meat and stir until browned, about 5 minutes. Remove with a slotted spoon and set aside. Add another Tbsp oil to the same pan. Add the cardamom pods, bay leaves, cloves, peppercorns and cinnamon. Stir until fragrant, about 15 seconds. Add the onions and cook until they start to turn brown, about 5 minutes. Add the ginger paste and stir 30 seconds. Add the coriander, cumin, paprika, cayenne and salt and stir another 30 seconds. Add back the meat with its juices. Add the yogurt 1 Tbsp at a time, stirring well after each. Cook mixture about 3 minutes. Add 15 oz water to the pan. Bring to a boil, stirring to deglaze. Cover, place in oven and cook for 2 hours. Remove from oven and stir in garam masala. Season with additional salt and ground black pepper, if desired. Serve with steamed long-grain or basmati rice, as well as an assortment of relishes, chutneys and naan. This entry was posted in Beef, Indian, Main Dishes and tagged Cooking, Food, Food Photography, Foodie, Indian Food, paprika, Recipes, Spicy on February 16, 2014 by AnotherDish.